Will HITLER Crack up this Year? People of the Western world would be stunned — dumbfounded — if they knew! The governments of the United States, Britain, Canada, Australasia, South Africa would set in motion gigantic crash programs — if they knew! They could know! But they don't! Why? CONSIDER THIS: Such small nations as Ethiopia, Libya, Turkey, Egypt are referred to in biblical prophecy. Russia is in the prophecies. How could such world powers as the United States and Britain be ignored — or are they? AND CONSIDER THIS! About one third of all the Bible is devoted to prophecies — about 90 percent of them foretelling world events of our time now — last half of the 20th century. Yet even theologians have not understood these prophecies — which tell us what now lies immediately ahead in world events that will involve YOU and all the rest of us. The KEY that unlocks these earth-shaking prophecies involving the United States and Britain — had been lost! The definite identity of the United States and Britain in the prophecies is that KEY. That KEY has been found. It is revealed in this book — possibly the most astounding truth in the Holy Scriptures! CONSIDER FURTHER: Never in history have two nations risen so suddenly and quickly from virtual obscurity to unprecedented national wealth, greatness and world power as these two peoples! Was it mere chance? Or were they providentially, as prophesied thousands of years ago, given this world dominance for a reason? AMAZINGLY CONSIDER THIS: Beginning the year 1800 Britain and the United States were little and insignificant as world powers. But then the fantastic spurt to world dominance began. By 1804 London was the financial hub of the world. From 1800 the United States miraculously sprang from original 13colony impotence to become the greatest nation on earth. The Louisiana Purchase in 1803 suddenly made the United States a nation of world prominence. Soon the British Empire encompassed the world. They boasted that the sun never set on their Empire. CONSIDER HOW INCREDIBLY GREAT: Before World War II, the United States and Britain had acquired more than two thirds of all the cultivated resources and wealth of the world! All other nations possessed, combined, less than a third. CONSIDER OUR PLIGHT TODAY! But now Britain's sun has set. Her Empire is gone! She is no longer "GREAT Britain." And America — still perhaps just barely ahead of the Soviet Union in military power, has, as prophesied, lost the pride of that power — we are afraid to use it! Little Iran holds the great America hostage for months. The United States, always generous in aiding other nations, is hated above all peoples! We have lost will, purpose, prestige. WHY? 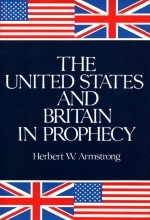 With resounding force and dynamic style Herbert W. Armstrong gives clear understanding and warns of what biblical prophecy reveals is soon to happen to America and Britain. Millennia ago, national greatness, wealth and power were promised by the Almighty God to the patriarch Abraham. Did God ever keep those promises to his descendants? They were never fulfilled in the Jewish people! FINALLY: The very fate of the Bible — the question of the existence and ·power of God — hangs on the true answer. It is amazingly incredible, unbelievingly eye-opening! It is vital to our national existence? Maybe it's our fate — yours and mine — that hangs in the balance. You'll find this book exciting and important reading. Because there is the great God who says: "The Eternal wrecks the purposes of pagans, he brings to nothing what the nations plan; but the Eternal's purpose stands for ever, and what he plans will last from age to age .... The Eternal looks from heaven, beholding all mankind; from where he sits, he scans all who inhabit the world; he who alone made their minds, he notes all they do" (Ps. 33:10-15, Moffatt translation). This same Eternal God said: "To whom then will ye liken me, or shall I be equal? saith the Holy One. Lift up your eyes on high, and behold who hath created these things ...." And again: "Behold, the nations are as a drop of a bucket, and are counted as the small dust of the balance .... All nations before him are as nothing ..." (Isa. 40:25-26, 15, 17). That key has been found! We present it to those whose unprejudiced eyes are willing to see.